The relationship between Asante Kotoko and Portuguese sportswear designer Strike is well underway and — while it’s still only in the honeymoon phase — Ghana’s most adorned club is already looking the part, flaunting their new armour both home and abroad. Strike has offered Kotoko quite a package: jerseys, training gear, tracksuits, backpacks, trolleys — the full set. But, of course, it’s what the Porcupine Warriors don on matchday which is most conspicuous and, unsurprisingly, that’s the very item fans are being encouraged to fetch for GH₵ 70 from designated sale points. Now, times are hard — well, they are for me — and that sum is substantial enough for anyone to part with, hence whatever they’re getting for that much better be worth it. First, consider the home jersey. It’s as red as can be — no prizes for guessing — and garnished with licks of white for those who place a premium on aesthetics. The collar is roundish, but with its front-facing side hanging slightly lower – not unlike Nike’s current style — and without the white band which decorates the remainder. White — an ideal contrast to red, no doubt — also pipes down the sides of the shirt and shorts. The numbers, cuffs, and ‘Strike’ logo are white, too, by the way. Horizontal, watermark-like stripes line the trunk and get broader till the series eventually fades into a deeper block of red halfway into the shirt. 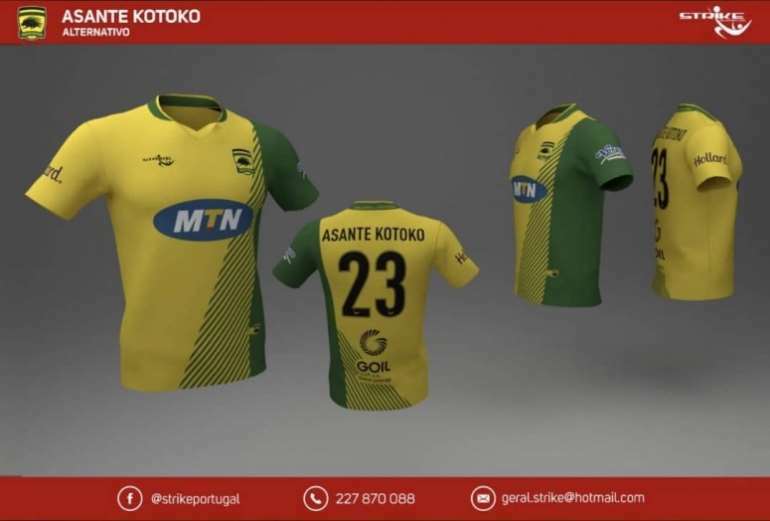 That Kotoko is one of Ghanaian sport’s most valuable brands is apparent on the shirt, with sponsors old and new — MTN, Hollard, GOIL and Paradise Pac — represented on the front, sleeves, and back. Oh, and there’s the club’s famous logo, too: black, green and gold as always. It’s a bit disappointing that those colours — traditionally the club’s — didn’t dominate Kotoko’s second-choice apparel. Strike opted for a uniform that’s almost the exact opposite of the primary strip: white swapped for red — and vice versa — in almost every place. Still, there are tweaks, however slight. The collar is V-shaped and all-red. The stripes are present here, too, only diagonal and beginning in the middle. Strokes get increasingly broader all the way through, eventually almost growing as dark as the numbers and the manufacturer’s logo. But, really, what do Kotoko fans themselves think of Strike’s debut? That’s a claim tough to counter. Overall, Strike couldn’t have done much better for its first African club partner, although the alternative version pictured just above would have been more in sync with the club’s Asanteman roots while providing greater variety in colour. If there is room for improvement — when has there never been? — future offerings should fill it. For now — and for GH₵ 70 — we’ll take this.